Combination two neighborhood countries Cambodia and Vietnam will offer to you both of the natural beauty and fascinating cultures. Hence, the diversity of this stunning corner of Southeast Asia bring an unforgettable experience in Vietnam Cambodia package tour 2018 in two weeks. Travel Sense Asia are designed to feature the highlights of both countries while offering personalised opportunities to experience what makes each unique. Hanoi is famous for the huge of culture and long-time historical sites that attract a lot of tourists. 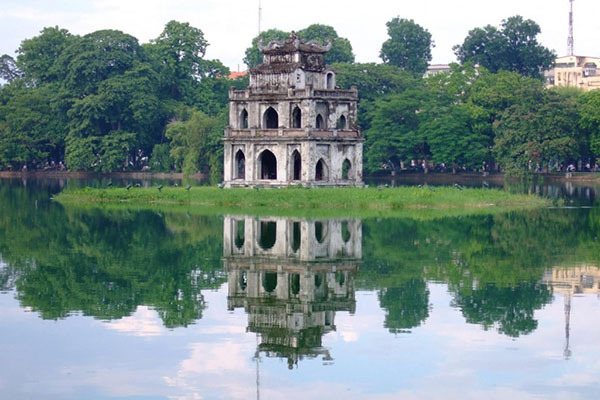 The first destination in Hanoi is Ho Chi Minh complex which involves the Mausoleum, his former stilt-house residence, and one-pillar pagoda. After that, you can take the bus to Vietnam Museum of Ethnology displayed the traditional tools of the 54 officially recognized ethnic groups in Vietnam. At the end of the day, The Water Puppet show is the choice for travelers which is a traditional show of Vietnamese people. It is believed that the performance of actors will bring for you the strange feeling. Actually, the farming or legends like the golden turtle and the Emperor are traditional activities. 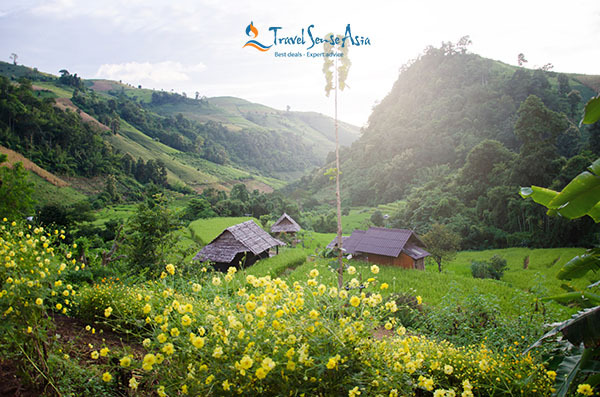 Sapa is known for its fresh population by its proximity to incredible scenery and the giant mountain. Sapa is home to many hill tribes such as the Hmong, the Dao, the Muong and the Tay. Cat Cat village is the old village of ethnic groups which attracts tourists from all over the world for its distinctive customs and practices. This is an opportunity to see farms and techniques used by the people in the area. Cat Cat village, the home of the Black H’mong people, who is famous for its brocade weaving craft as well as its gold and silver jewelry making. Thus, you can buy some traditional souvenirs such as twisting flax and weaving fabric. Next, Shin Chai is a community village which is known for cultural acclimatization. They wear the colorful clothes with distinctive jewelry and the red turban. You will approach to the daily activities of village community. Muong Hoa is the largest farmland for rice growing in this destination. Coming here, you will admire one of the most famous places for breathtaking scenery. You need to trek along Muong Hoa River to approach Muong Hoa valley. On the way, you can learn more about how is the rice cultivating. Muong Hoa valley is created by lots of colorful flowers in the various beauties. Sapa is famous for its markets, and on almost every day in the week. 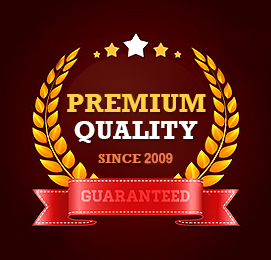 Therefore, you don’t worry about missed any markets during the coming time. For distance, Coc Ly Market opens on Tuesday which is a great place to buy traditional costumes and to learn more about the local culture. On Wednesday, Sin Cheng Market is a small market in the Si Ma Cai district, where you can meet several ethnics of the White H’Mong, Flower H’Mong, Tay and Black Dao who sell the beautiful traditional costumes. Sometimes the market can be hard to reach due to road conditions. After one day, Lung Khau Nhin is located high in the mountains of the Tram Ton pass. There are two largest markets organized in the weekend like Can Cau Market and Bac Ha market. You can buy several products, such as handicrafts, traditional costumes, and food. Various tribes are gathering at this market. 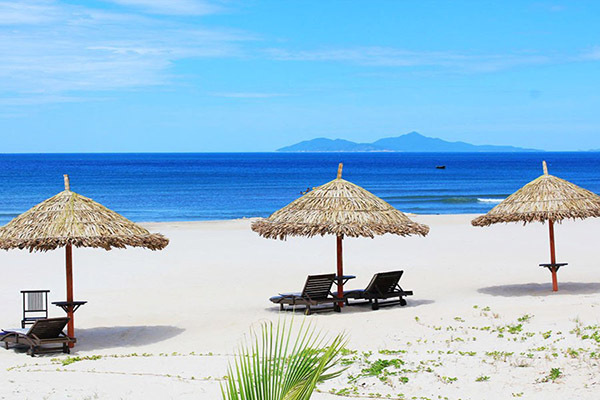 Danang is one of the greatest destinations in Vietnam country. It is famous for Bana Hills – one of the most attractive destinations. Sitting on Carbin, you can see the mountains, streams… which is very impressive. There are many places you should visit in Bana hills like Le Jardin D’Amour Flower Garden, Vong Nguyet hills, Linh Ung Pagoda, the Old Villas of French. Firstly, Mo Stream is the attraction place, you must trek up the mountain. The pristine stream is the natural landscape. Coming here, you can take the greatest pleasure of swimming in the cool water. The next place is the Wax Museum where displays a copy of Showcase politicians, celebrities from all over the world such as Lionel Messi, David Beckham, movie star Jet Li… Free for joining a game in Fantasy Park which is the largest state in Vietnam and satisfies the entertainment demands of all ages. If you come here, you can join the entertainment paradise with all kinds of game: 4 – 5D film, skiver, the death race, dinosaur park… Then Debay Wine Cellar is home to an abundance of grape wine. My Khe is worldwide known as one of the most beautiful beaches in the world which always welcome you to all harmonious facilities supplied for tourism, convenient transportation, free entrance for tourists. The weather and wave in My Khe beach are very suitable for swimming or takes place the water sports like diving, water-skiing, diving, and a yacht race. Besides, you should try many special kinds of seafood like shrimp, crab, squid, and abalone. Hoian is stunning mix of architecture. The Chua Ong Pagoda was built in 1653 in honour of the Chinese general Quan Cong, who is worshipped by many as a symbol of loyalty and justice. The Fujian Assembly Hall, which bears all the fundamental features in the structure of a Chinese Assembly Hall, is believed to be built by Chinese merchants of the Fujian Province. You visit traditional fishing boats. Next, you will have an experienced tour with the Lifestart community which is a non-profit charity organization. Especially, you will learn life skills through handicraft. 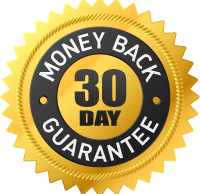 The mission of this tour directly supports disadvantaged of members of the community. Ho Chi Minh has systems of infrastructure and tourism service developmentally. 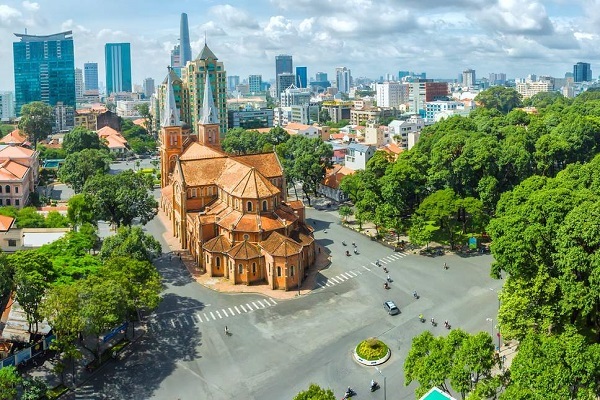 The first place you should come to is Duc Ba church because of its design, apart from the intention to create a religious look, aims at showing the influence of French architecture. Some couples come to take photograph and record movies, especially for the wedding. You should go to Saigon Central Post Office to admire its interior. The office can provide many services for visitors such as sending letters, changing money, selling stamps and coins. If you want to search for the place where offers local handicrafts, Vietnamese art, and other souvenirs, let’s go to Ben Thanh market. 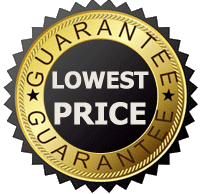 However, you should bargain the price of goods you want. One recommendation for you is to come to Saigon Opera House has been constructed by the French architect. The Saigon Opera House becomes a theater for a variety of traditional and classical performances. In the morning, the driver will pick up you at your hotel and move to Ben Tre. 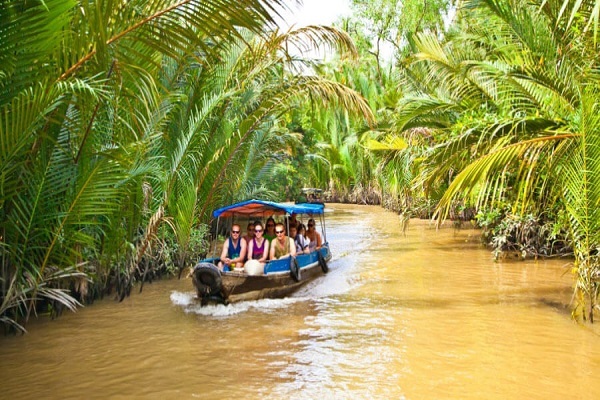 The most famous transportation in here is a small boat, so you can use the one to start your sightseeing around the waterways of Mekong Delta. You should come to the island with lush tropical gardens to know the history of the regions and steers. Next, the tour can visit the brick factory and board a small boat and meander through the canals and waterways. The stopping place is a small homemade coconut to see how coconuts have been produced, and woven mats that are later sold in the market. From there, you should come to a bee farm where you have a chance to taste a tasteful cup of authentic honey tea. This is special food in here. At this time, you also walk around quiet villages and watch the life of rural people in Mekong Delta. It is a chance to learn that those people can amazingly make dozens of useful products out of coconut trees. After that, you can participate in a demonstration of Vietnamese cooking as you enjoy a three-course lunch of Mekong specialties! Coming to the traditional handicraft villages and tropical fruits gardens, you can enjoy the typical folk music in Southern Vietnam. Cai Rang Floating Market is open all day but it is crowded from sunrise to about 9:00 a.m. The vendors can exchange the goods. For example, they usually change the fruit to rice or daily tools. Especially, you can buy particular items such as fruit, daily tools, traditional foods,…It is believed that the price of these is quite cheap. After that, one recommendation for you is walking around the village and meet the friendly local people and experience how to pass a “Monkey bridge” which is built by only one stem of bamboo. Then you proceed to Chau Doc, continue the tour to visit Tra Su. Let’s take a small boat to approach the wild birds Sanctuary to discover the arrays of splendid canals deep into the forest and watch storks, cranes and other tropical birds. Another place in Vietnam Cambodia package tour is Chau Doc. Visiting floating market, you will know the trading fruits, vegetables and fish. Continuously, you come to a local Cham Village, where you will learn more about fascinating stories. You will admire the lush green paddy fields of Chau Doc. You will be satisfied with the life of local villages. You can take some fast foods, ice tea or coffee on the road and chat with local people. Welcome to Phnom Penh, it includes the fascinating Royal Palace, the Silver Pagoda, and the National Museum. You can climb the hill to Wat Phnom, the city’s main temple. Let’s experience with a Tuk Tuk for 20$ for the entire day, you will get a strange feeling. 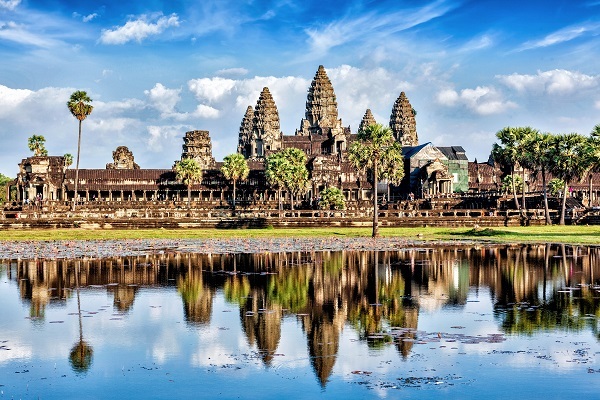 Angkor Wat and Angkor Thom is an unforgettable place, you will open your eyes to beautiful sights, heartbreaking history and limitless warmth, kindness, and hospitality. Next, Silver Pagoda is located in the southern portion of the Royal Palace complex, Wat Preah Keo Morakot. The pagoda was formerly known as Wat Ubosot Rotannaram. Why? One of the most reasons is this pagoda is where the King worshiped, prayed and practiced every Buddhist Silas Day. The National Museum of Arts is the country’s largest archeological and cultural history museum. It helps you to have a sight on the cultural side of Cambodian history dating back to the 4th century. One of the most popular places in Vietnam and Cambodia package tour in 2018 is South Gate of Angkor Thom. Angkor Thom is famous for 54 towers decorated with over 200 smiling faces of Avalokitesvara, the Phimeanakas, the Terrace of the Leper King, the Royal Enclosure, and the Elephants Terrace. The Bayon Temple has its huge statues depicting the churning of the ocean of milk. Afternoon, you explore Angkor Wat the most famous of all the temples on the plain of Angkor. The Cambodian flags are set up in the five towers which are the prime example of classical Khmer art and architecture. Then you view a wonderful sunset from Angkor Wat or somewhere possible.